South Gallia junior running back Kyle Northup receives a handoff from quarterback Tristan Saber during the first half of Friday night’s Week 2 TVC Hocking football contest against Waterford in Mercerville, Ohio. MERCERVILLE, Ohio — It’s the time of year when fleas, ticks and mosquitoes have no problem drinking a little bit of your blood. On Friday night, however, the turnover bug went out of its way to drain the life out of the Rebels. Visiting Waterford forced six turnovers and scored 28 points off of those miscues during a 41-6 victory over the South Gallia football team in Week 2 Tri-Valley Conference Hocking Division opener for both programs at Rebel Stadium in Gallia County. The host Rebels (0-2, 0-1 TVC Hocking) committed three turnovers apiece in each half, including a trio of miscues before halftime that gave the Wildcats (2-0, 1-0) great field position on three scoring drives en route to building a 21-0 intermission advantage. Waterford recovered a fumble on South Gallia’s first offensive possession, then needed only five plays to cover 38 yards while taking a permanent advantage. George Pantelidis hauled in a Peyten Stephens slant pass and covered 24 yards to paydirt, giving the guests a 7-0 cushion with 5:55 left in the opening period. 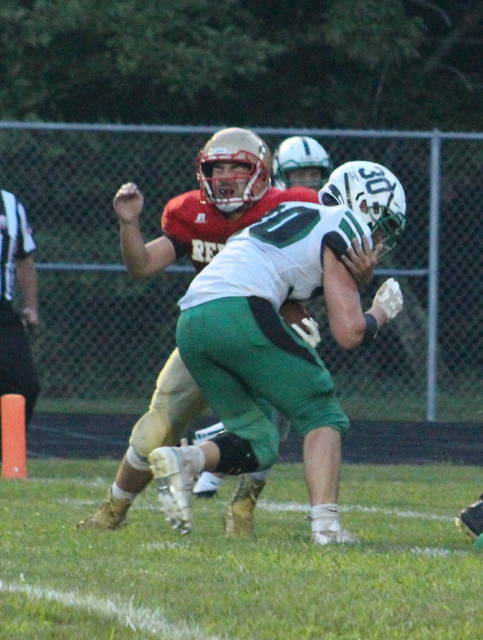 Joe Pantelidis came away with an interception on South Gallia’s ensuing offensive drive, which gave the Green and White the ball at the Rebel 26. WHS needed just three plays to cover the distance as Braden Bellville plunged in from a yard out, giving the Wildcats a 13-0 edge with four seconds left in the first stanza. 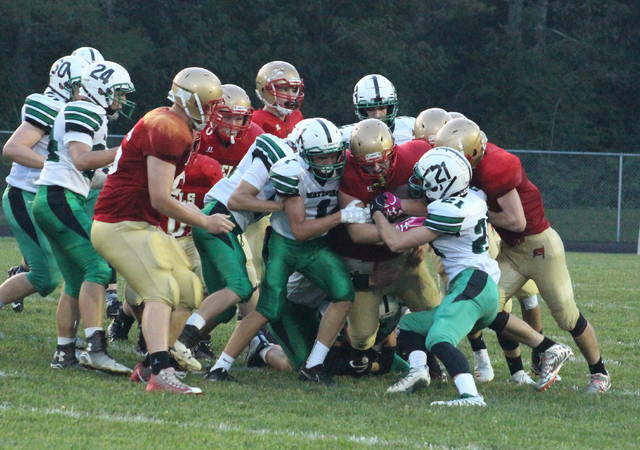 The Rebels answered by stringing together a 15-play drive that made it all the way down to Waterford 16, but a sack and a Zane Heiss interception return gave the guests possession at the Rebel 32 with 4:08 left in the half. The Cats needed just four plays to cover the distance as Stephens capped things with a one-yard run at the 3:07 mark, making it a 21-0 contest. 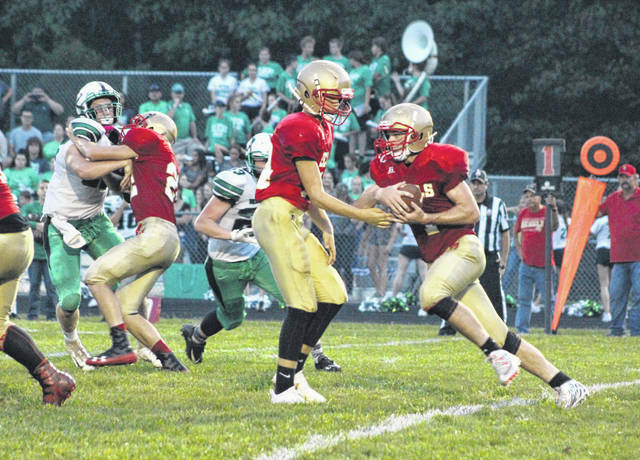 The Red and Gold forced their lone takeaway of the night midway through the third period as Caleb Johnson recovered a WHS fumble during a punt return, giving the hosts new life at the Wildcat 30-yard line. Three plays and 30 yards later, the Rebels were back in the ball game following a 27-yard scoring run by Kyle Northup that made it a 21-6 contest with 4:33 remaining in the third. The Wildcats, however, needed just 15 seconds to increase their lead back out to three possessions as Holden Dailey picked up a semi-deep kickoff and returned it 80 yards to the house — putting Waterford back out ahead by a 27-6 count with 4:18 left in the third canto. The guests put together their longest drive of the night between the third and fourth quarters, a nine-play, 70-yard drive that led to a 35-6 advantage following a Bellville five-yard run with 9:15 left in regulation. The Rebels responded with a 13-play drive that led to a first-and-goal situation at the one, but the hosts ultimately lost four yards on third down and then ran into misfortune on fourth down. Joe Pantelidis stepped in front of a Tristen Saber screen pass at the two, picked it off and rumbled 98 yards down the field untouched while making it a 41-6 contest with 1:50 remaining in regulation. South Gallia’s final drive made it out to the 23 before the final play of the game resulted in a Waterford interception. The Wildcats outgained the hosts by a slim 204-172 overall margin in total offense, but the Rebels did have a sizable edge in the rushing department with a 172-72 advantage. South Gallia also claimed a 13-9 edge in first downs, but also finished the night minus-5 in turnover differential. The Red and Gold were flagged only once for two yards, while the guests had nine penalties for 65 yards. Waterford also amassed all 132 passing yards in the contest. Following the game, SGHS coach Mike Smith noted that the turnovers played a large roll in the outcome — particularly since everything else in the game plan seemed to be working. The Rebels rushed 54 times for 172 yards, an average of 3.2 yards per carry. Northup paced the hosts with 102 yards on 17 carries, followed by Jeffrey Sheets with 37 yards on a dozen totes. Tristen Saber had a rough night under center in going 0-for-5 passing with four interceptions to go along with seven carries for minus-10 yards. South Gallia did not have a reception in the setback. Bellville led Waterford with 74 rushing yards on 14 carries, while Stephens completed 8-of-11 passes for 132 yards, throwing one touchdown and zero picks. George Pantelidis led the WHS wideouts with three catches for 68 yards, followed by Nick Fouss with three grabs for 58 yards. The Rebels — who have now dropped eight consecutive decisions — return to action Friday when they travel to Stewart to face Federal Hocking in a Week 3 TVC Hocking contest at 7 p.m.